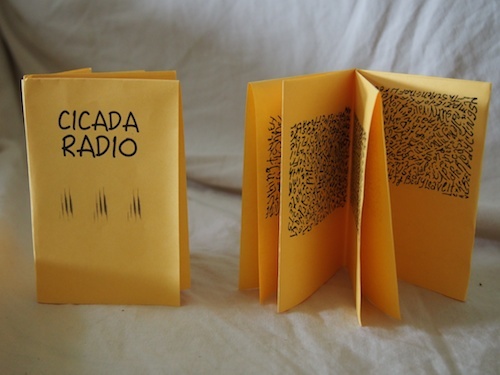 Jessica Smith has brought forward to me— and therefore you if you want to get one—this lovely little hand drawn chapbook called Cicada Radio. There’s an essay by here here. Michael e. Casteels of puddles of sky press has for us a set of micro fictions. 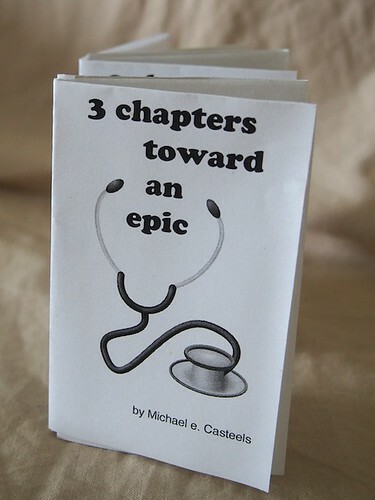 “3 Chapters Towards an Epic. aftermaths by LeRoy Gorman. Part minimalist poetry, part visual, and part mathematical equation. Nice Haircut, Fiddlehead by Stuart Ross. A real surprise bag of a chapbook, inside you’ll find a sonnet, a prose poem, a list poem, a poem with a single word for each line, an elegy, a lament, a translation of a translation, and a whack of other wonderful poems. sorrow is to row by Michael e. Casteels. A single typewritten poem with hand-stamped covers. After bpNichol. Only 26 copies. You can get those at the fair or order them online. He’ll be with me on air, with any luck, on the next Literary Landscape along with Sarah Pinder.